I can't believe I am about to say this but for someone that doesn't like cheese actually enjoyed going to a restaurant where almost every dish contained cheese. A lot of cheese. What happened? Who am I?! I haven't been converted but I am a bit more open to cheese more so than before. And yes, that is a man mixing and tossing the spaghetti in a giant cheese wheel. The menu at Buffalo Dining Club is small and out of the 10 to 15 ishes, I believe there were only two or three non-cheese dishes. The main cheese that is served is obviously buffalo cheese. It was my first time trying it and I found it wasn't as heavy or as strong as other types of cheese. For entree's, you are given a choice of either burrata or buffalo cheese to be accompanied with sides of your own choosing. The waitress made two offers. Either we could choose or she took the reins and made the calls. I think it was a good idea we left the decisions in her trusty hands because dam, she definitely chose the right things. Oh em gee, my stomach was in food heaven. I almost also forgot to mention that I fell in love with their sicilian olives (and their marinate) and yes, olives are also another thing I usually do not like eating either. What is happening people. 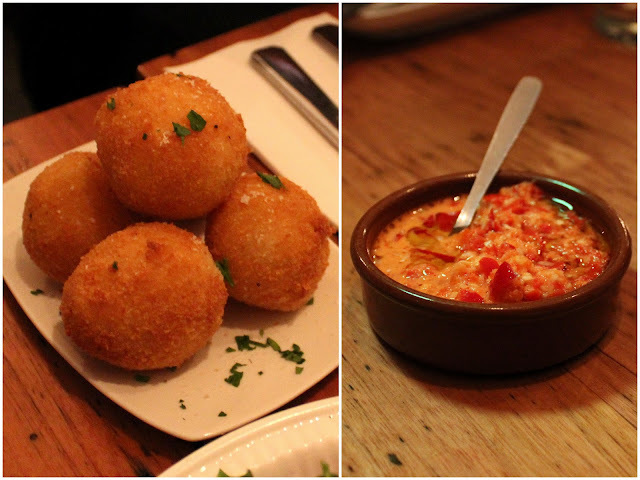 The potato croquettes were probably the best croquettes I have ever had. It wasn't oily, the potato inside was super light and fluffy while the outside was crunchy. The 'salsa' that came with the croquettes had a surprisingly strong kick to it. Ok get ready people because here comes more cheese. I thought the spaghetti would be heavily covered with cheese but there was a reasonable amount. The garlic wasn't overpowering and the pasta wasn't dripping in gallons of olive oil. It could of done with more salt but overall, it was quite light for a pasta dish. The gnocchi was the opposite to the spaghetti. It was drowned in a lot of cheese but that is what made it such a hearty dish. On a different note, unfortunately even though I have 'opened up' to slowly trying out different types cheese, Sir Blue Cheese and I are still not friends. Maybe one day... maybe. I actually preferred the entree's over mains which is a first for me. The spanish ham, roasted vegetables, sicilian olives and the potatoes croquettes out wins the giant cool cheese wheel. I can't wait to come back for more cheesy nibbles. Yum!!! I need to eat here!!! I love cheese, all cheese, all the time. Each of the dishes looks so delicious! Love the ricotta gnocchi too! wasn't a cheese fan when i was younger either but this has definitely changed over the last decade or so. would love to try the buffalo mozzarella and that pasta from the cheese wheel. i love my cheese so i think this place should be visited soon! i too dont like the saltiness of olives so i may give that oone a pass! loving the giant cheese whell tho, id want to take it home! so. much. cheese! I really need to check this place out, especially for the spaghetti mixed in the cheese wheel! I can understand those who dislike cheese since the aromas of some varieties have been likened to smell like dirty socks and underwear. On the same token, those who like cheese usually like them for those same intense aromas. You had me at cheese. This is on the must try lift, for sure. OMG. That spaghetti, that pecorino wheel...I MUST HAVE THAT PECORINO WHEEL!!!!! I almost always prefer the entrees over mains ^^" but omg cheeeeeeeese glorious cheeeeese! sounds like you're already on the road to cheese appreciation! and i love ordering the spaghette cacio e pepe here. so much fun! Oh I have heard about this place from other bloggers and I know I will have to try it! 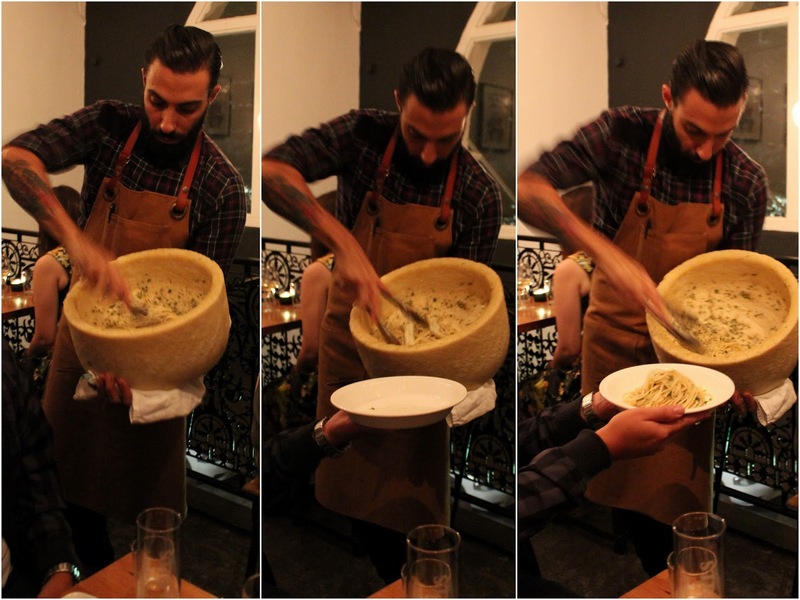 I adore cheese, I would love to try the spaghetti in the pecorino wheel!! YUM! hmmm ... I think I know what I want to order already when I go! I was contemplating dining here, you might have just sold me with that cheese wheel pic. Cheese wheel and me go hand in hand! As a cheese lover I think this place is heavenly!